Martin Short intended to become a social worker after graduating from McMaster University, but being cast in a Toronto production of Godspell gave him the acting bug. Short was encouraged to pursue comedy by classmates Eugene Levy and Dave Thomas and he joined them in the Canadian improvisation group The Second City in 1977. Shortly before Short joined, The Second City was spun off into its own television program called Second City Television, or SCTV. Short developed several characters during his time at Second City, including Edward Mayhoff “Ed” Grimley. The character debuted as an unnamed school parent in a sketch, having extremely greasy and unkempt hair. The character slowly evolved with each additional appearance. Short began greasing his hair straight up after being inspired by a scene in the John Wayne movie McLintock!, and added the quirt of incidentally baring his teeth when he noticed the laughs it garnered. Over time, Ed became a hyperactive manchild obsessed with popular culture. He was a complete fanboy for Pat Sajak, host of Wheel of Fortune. Grimley fancied himself a musician and played the triangle; of course, playing it consisted of dancing wildly to a musical recording before hitting it once. Short became a cast member on SCTV for the 1982-83 and Grimley became a fixture on the program. He not only appeared in the skits, but in commercials, promos and “behind-the-scenes” drama. For the 1984-85 season, Short went on to join Saturday Night Live and brought Grimley with him. Short became popular on the show, which led him to have a long career in film and television. The character appeared on his Showtime special Martin Short: Concert for the North Americas, Comic Relief 1986, and I, Martin Short, Goes Hollywood, as well as a guest-appearance with Billy Crystal on Sesame Street. 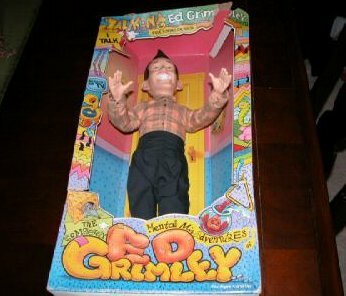 Short partnered with Hanna-Barbera Productions, in association with SEPP International S.A., to bring Grimley to Saturday morning television; in part as a means to entertain his children, and in part because NBC was hoping the Grimley persona could stand up against CBS’ Pee-Wee Herman. Short himself provided the voice of Grimley, as well as Emil Gustav of the scientific duo, the Amazing Gustav Brothers. The rest of the show was filled with Short’s friends and fellow Second City cast mates: Andrea Martin played co-landlord Deidre Freebus; Catherine O’Hara played Grimley’s lovely and ditzy amateur actress neighbor Ms. Malone; Joe Flaherty appeared in live-action segments as his character Count Floyd; and Short’s mentor Jonathan Winters played landlord Leo Freebus and the other Gustav brother, Roger, as well as the Gustav’s mother (based on his Maude Frickert character). Fellow SCTV alums included Levy in a guest-starring role and Dave Thomas in several supporting roles, as well as SNL alum Christopher Guest (who also appeared in Short’s 1985 special) as a guest-star. Rene Auberjonois, Kenneth Mars and Arte Johnson also lent their voices to various episodes. Danny Cooksey played the role of Ms. Malone’s little brother Wendell. The Completely Mental Misadventures of Ed Grimley debuted on NBC on September 10, 1988, becoming the first Saturday morning adaptation of an SCTV or SNL property. 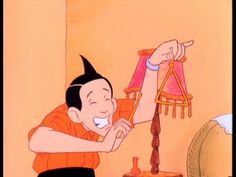 The intro featured a live-action Grimley interacting with the world and characters of the show before becoming the animated Grimley himself. The series’ music was composed by Michael Tavera. 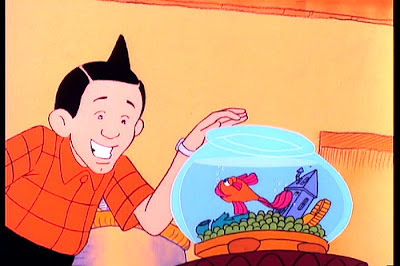 Episodes would typically follow a mundane day in the life of Grimley, who lived alone with his goldfish Moby and pet rat Sheldon (Frank Welker). All of Grimley’s trademarks were present, including his catchphrases “I must say,” “Pretty decent,” and “Too much,” as well as his manic dancing and affinity for the triangle. However, Grimley’s day would typically end up going bizarrely sideways as only they could to a self-aware cartoon character. Count Floyd and his latest non-scary story. Regardless of the situation, Grimley would always find time to tune into his favorite show (next to Wheel of Fortune): Count Floyd’s Scary Stories. 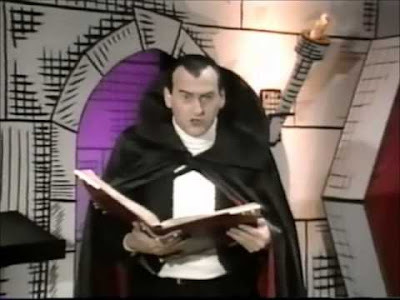 It was a live-action show-within-a-show where the howling vampire Count Floyd would regale his children-filled audience with the most un-scary stories imaginable (a parody of TV horror hosts from the 1950s and 60s who were stuck hosting nonfrightening films). Another recurring segment would feature the Gustav brothers attempting to tie a science lesson into the main story—sometimes successfully. Midway through the season, Hanna-Barbera held an Ed Grimley look-alike contest to promote the show. The winner was 10-year-old Matt Mitchel from Des Moines, Iowa. 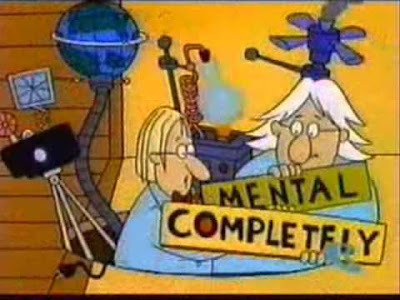 Despite airing on Saturday mornings, the show was really geared towards an older audience with the types of references and in-jokes used. As a result, it ended up losing out to the ratings powerhouse Pee-Wee’s Playhouse. The Writer’s Guild strike of 1988 also played a factor in the show getting cancelled at the conclusion of its only season. Short unsuccessfully proposed moving the show to primetime where its content would find a better audience. Hanna-Barbera had begun development on a star vehicle for Whoopi Goldberg, but with Ed Grimley’s cancellation those plans were abandoned. Ed Grimley would remain on NBC until the following September, when it was replaced by Camp Candy, which starred fellow SCTV alum John Candy. Ed, Ms. Malone and Wendell with a southern gentleman. 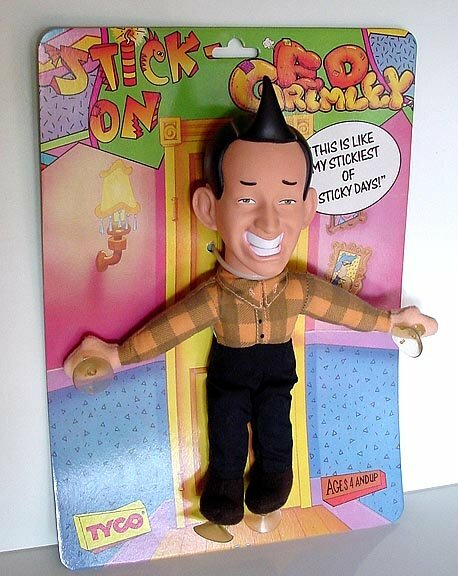 Ed Grimley would find success in reruns on Cartoon Network in the 90s. The Count Floyd segments would be rebroadcast independently of the rest of the show as part of Cartoon Network’s animated variety show Cartoon Planet. In the meantime, Grimley made appearances on Short’s television shows The Show Formerly Known as the Martin Short Show and The Martin Short (Talk) Show, as well as Muppets Tonight and several returns to SNL. Grimley would also appear in Short’s stage shows Martin Short: Fame Becomes Me and Let Freedom Hum: An Evening of Comedy Hosted by Martin Short. Its short run yielded some merchandising. Tyco produced a large talking doll and a smaller talking window cling resembling Grimley. 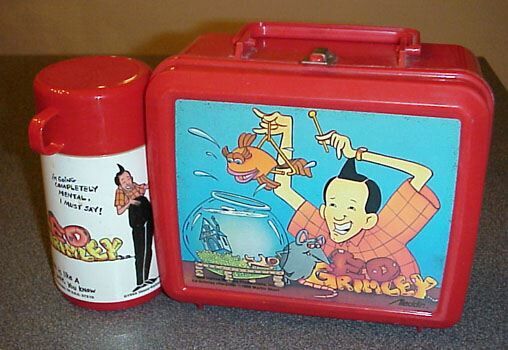 Thermos released a plastic lunch box and Tiger Electronics made a handheld game called Electronic Ed Grimley that was released in 1989. In 2010, Warner Home Video included the first episode on their compilation DVD Saturday Morning Cartoons: 1980s Vol. 1. Warner Archive released the complete series to DVD in 2013 as part of their Hanna-Barbera Classics Collection. 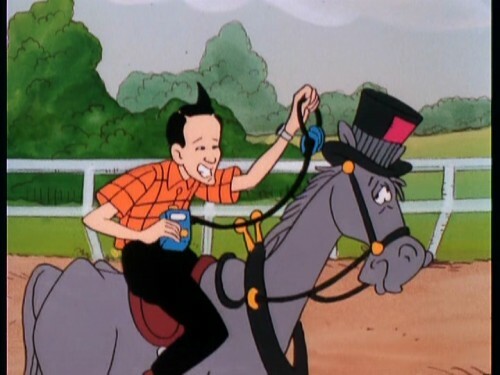 “Tall, Dark and Hansom” (9/10/88) – Filling in for his cousin ends up putting Ed in a horse race with a hansom cab. “Ed’s Debut” (9/17/88) – Ed is mistakenly arrested for a bank robbery while on his way to make his triangle debut with the city’s philharmonic. “E.G., Go Home” (9/24/88) – An amusement park rocket ride takes Ed and Wendell to another planet ruled by an alien queen. “Ed’s in Hot Water” (10/1/88) – Ed is asked to watch the building for the Freebuses and is washed out to sea when he tries to fix the hot water heater. “Crate Expectation” (10/8/88) – Ed ends up in a crate trying to get a birthday present for Miss Malone, while she’s visited by a guardian angel who shows what would happen if she wasn’t born. “Grimley, P.F.C.” (10/15/88) – Ed goes to return a library book and ends up joining the Army. “Moby is Lost” (10/22/88) – Ed hires a sea captain to find the missing Moby. “Good Neighbor Ed” (10/29/88) – Ed must take a picture of all his neighbors to win a contest. “Driver Ed” (11/5/88) – Teaching Miss Malone to drive leads her and Ed to become wandering spirits haunting Mr. Freebus. “Blowin’ in the Wind” (11/12/88) – A tornado whisks Ed to a farm where a traveling stock show work for a chance at Broadway. “Eyewitness Ed” (11/19/88) – Ed witness a robbery and ends up in the Witness Protection Program. “Eddy, We Hardly Knew Ye” (11/26/88) – Ed’s tonsillectomy puts him in a hospital room with a werewolf. “The Irving Who Came to Dinner” (12/3/88) – Irving Cohen helps Ed expose a couple of con artists.